Email newsletters are commonplace among corporations and non-profit organizations. After all, they are inexpensive to produce and are an easy way to stay in touch with those that support your cause. As popular as they are, there are common mistakes made all too often. 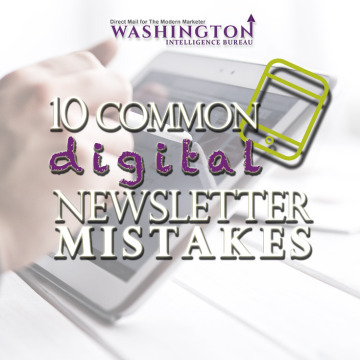 We’ll take a look at the top 10 and share fixes to help improve the effectiveness of your next newsletter. The number 1 way to guarantee a low open is to add people to your mail list without their permission. Simply because you have their information, does not mean they want to be added to your mail list. What to do: Use a verified opt-in. This will not only give you the permission you need but also ensure your are building a list of humans rather than bots. Using an opt-in will make list growth slower, but it isn’t a race. You will have better results with quality rather than quantity. Sure, the larger the list, the more opens you are bound to get. However, those opens aren’t all likely your target audience. If your list includes donors, volunteers and influencers and your messaging is geared toward volunteers, donors and influencers will be disinterested and could stop opening future messages. What to do: Take the time to segment your list and send out audience specific content. Yes, this may take a bit of time up front, but the end result will be worth it. Readers want to hear from a person or an organization, not from info@yourcause.org! They are smart enough to know that it’s likely an unmonitored address anyway. What to do: Create a from name that includes a real person’s name as well the name of your organization. Your readers will appreciate it! The subject line is equivalent to a first impression…make it a good one! What to do: Peak the curiosity of your readers with a tease of the content they will find when they open your newsletter and clearly identify what THEY will get from the content. We shared more tips on crafting a “Stand Out Subject Line” in a previous post. Who wants to read bland content? Not your readers, that’s for sure! What to do: Provide exciting stories and clear calls to action. Keeping the readers engaged from start to finish should be your ultimate goal. If your newsletter is nothing but words – no matter how great they are – readers will become dis-engaged and delete it before they are even close to finished reading it. What to do: Break your comments up into easy to read paragraphs and toss in a bright image, too! Obviously, you want to talk about your organization and share news and updates, but readers really aren’t interested in statistics. What to do: Clearly explain to readers what is in it for them. Tug on their heart strings a bit and get them to become more emotionally invested in what your organization is doing. It’s exciting after spending time crafting the newsletter to hit the “SEND” button, but slow down! Typos will make readers questions your credibility. What to do: Technology is great — take advantage of it. Whatever program you are using, it is sure to have spell and grammar check capabilities. Nearly ½ of all emails are read on a mobile device. If it doesn’t look right on the reader’s screen or is difficult to read it is likely to get deleted or forgotten about in a busy inbox. What to do: Most mail programs offer an option to optimize your newsletter to be mobile friendly. Why not take advantage of it? You’ve shared progress and a great story or two with your readers but do they clearly know what they should do next? What to do: Including a clear call to action (or two) will keep them involved. A simple “Click Here” or “Read This” will keep readers engaged. The more involved you keep them, the more moved they will be to do more for your organization. Take a look at your past newsletters and see how many of these mistakes you’re guilty of making — don’t beat yourself up too badly, they are very common! Instead, focus your energy on not making them in your next one!